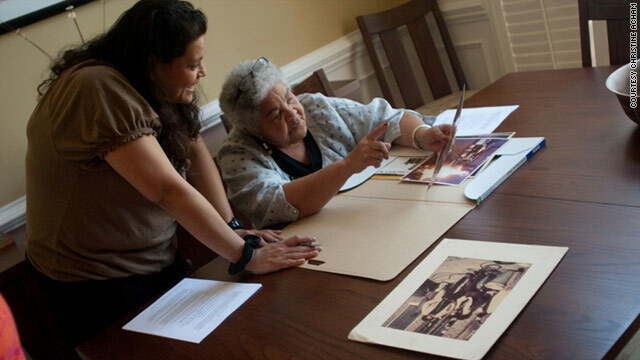 Christine Acham looks over images with Ivan Dixon's widow, Berlie, for a documentary on "The Spook Who Sat by the Door." (CNN) -- When director Ivan Dixon and writer Sam Greenlee were trying to get the politically charged African-American film "The Spook Who Sat by the Door" made in the early 1970s, they faced major challenges in securing funding. Not much has changed since then, says Christine Acham, a University of California-Davis professor who is working on a documentary about the making of the film. Acham said that though conditions have improved in the last 40 years, black filmmakers still struggle to get their films made. "It is always challenging for African-American filmmakers to get funding," Acham said. "It's clearly helped by the Oprahs and Tyler Perrys of the world, who have their own studios and the ability to greenlight projects, but outside of that, if you are an independent or a black filmmaker, it is difficult to get black stories told." Times are tough for Hollywood in general. With the country firmly entrenched in a recession, gone are the days when studio executives were eager to take a multimillion-dollar chance on projects that may or may not find an audience. Even filmmakers such as Melvin Van Peebles, John Singleton and Spike Lee who have found success via independent vehicles don't have free financial reign. Acham, who teaches courses on black film, television and pop culture, said that in such a tough marketplace, the road is even tougher for minority filmmakers. The professor said that with studios scaling back on the number of films they make and focusing on less risky ventures such as sequels, those going the independent route have to be creative. That includes working the film festival circuit, Acham said. "Film festivals allow the filmmaker to get their work out there," she said. "Obviously, with the rise of Sundance, people are taking a closer look at festivals, and for the independents, many are looking beyond Sundance perhaps because it has gotten so large." One such event is the American Black Film Festival, which launches its 14th annual edition Wednesday in Miami, Florida. Festival founder Jeff Friday said venues such as his are an integral part of the networking needed to launch the next successful filmmaker. "When you look at the independent filmmaker in general, it's a struggling population because you are making a product outside of the resources of the mainstream, and once you make it, you are competing with films from major studios," Friday said. "What we try to do is give the independent filmmaker an avenue to meet with the powers that be in Hollywood, with the hope that by exposing the Hollywood power brokers to the subset of independent filmmakers we will open doors." Such opportunities have been helpful for longtime attendees of the American Black Film Festival such as Lee Daniels, who was nominated for an Academy Award for directing the critically acclaimed film "Precious." "The world is having a very difficult time of it and that affects everything, including our art," said Daniels who first came to fame as producer of "Monster's Ball," an independent film whose star Halle Berry became the first African-American to win an Academy Award for best actress. Daniels is being feted at this year's festival. And this festival is not the only game in town. The website Withoutabox.com bills itself as "the world's largest independent film community" and offers information on more than 5,000 film festivals across the world. Acham said the internet is making it possible for filmmakers from just about any continent to share their work with the world with just the click of an upload. So the next Spike Lee or Robert Townsend could just as easily be a writer or director from Africa, Europe or the Middle East. Screenwriter Rhonda Baraka said that despite the tough times independents face, the landscape is also rich with the opportunity for creativity and to break into the mainstream. "I think movies appeal to people during tough times," she said. "By the same token, I think it appeals to us in the industry because we can create those other worlds for people to escape into."